The Chicago Department of Transportation (CDOT) and the Department of Procurement Services (DPS) have announced that the city is seeking bids for the construction of the long-anticipated Bloomingdale Park and Trail, with the intention of breaking ground this summer. The 4km-long elevated rail park looks set – according to the American Society of Landscape Architects (ASLA) – to give New York City’s High Line a run for its money. The $91 million (£59 million) project, co-designed by landscape architect Michael Van Valkenburgh Associates, Collins Engineers, local Chicago artist Frances Whitehead, and others will, according to Jared Green, editor of ASLA’s online magazine The Dirt ‘transform an abandoned freight rail line into a wonderful, green, public-art filled elevated park for both walkers and bicyclists’. What makes the park really different from the High Line, says Green, is that it is in a residential area on the west side of Chicago and it’s much closer to the ground (about five and a half metres high on average). Six ramps will lead up to the trail from streets and another six from nearby parks, ‘in effect creating seamless access between the old rail-line and the greater green tissue of the four neighbourhoods it transects’. In contrast, the High Line is in a dense commercial area, is much higher off the ground, and only accessible via stairs and elevators. The construction contract for the Bloomingdale Park and Trail includes the rehabilitation of viaducts and retaining walls, as well as removing the railway tracks and creating a multi-use path. CDOT will oversee the construction of the linear park, which will be open to visitors by the end of 2014. Construction bids will be accepted by DPS until 11am on 30 May. The City of Chicago will award the contract to the qualified bidder ‘with the lowest responsive bid’. 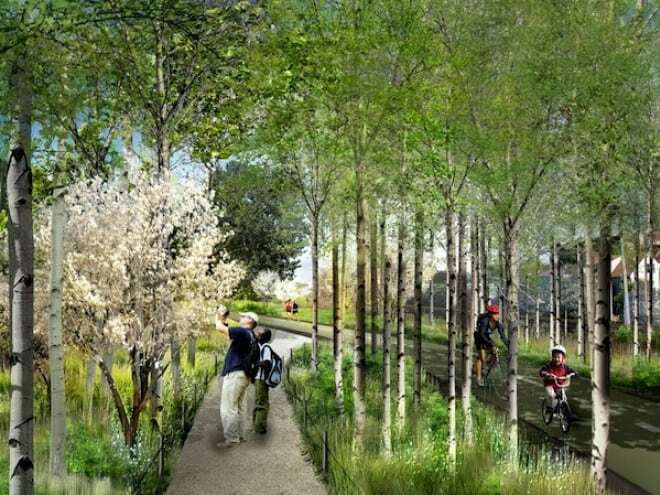 Designed to occupy an abandoned Canadian Pacific Railway viaduct between Ashland and Ridgeway Avenues, the linear park will be managed by the Chicago Park District. CDOT will maintain the viaduct’s walls and bridges and the Park District will maintain the trail and the 5ha of open space adjacent to it – on top of the viaduct. Plans are for two paths: one a 4.3m-wide trail with a ‘soft shoulder, landscape, water fountains and benches’, the other ‘a meandering nature path, an informal space for exploration’. The century-old structure, which runs adjacent to Bloomingdale Avenue, ceased to be used for regularly scheduled rail operations in 2001. Its redevelopment as a linear park and trail will, the city claims, build on its legacy for innovative open spaces, by linking four ethnically and economically diverse Chicago communities (Wicker Park, Bucktown, Humboldt Park and Logan Square) and five neighbourhood parks. Approximately half of the Bloomingdale Park and Trail’s projected development cost is being financed through federal highway and transportation grant funding. 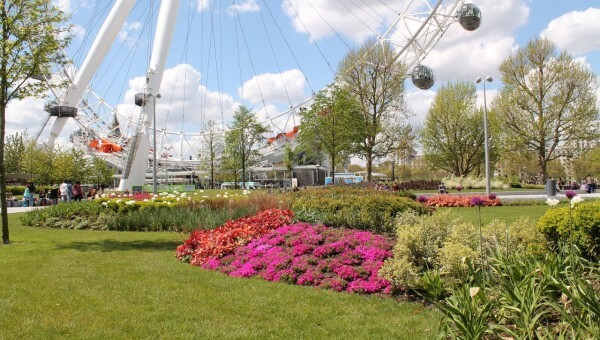 The remainder is being raised through a partnership between the City, the Park District, and the Trust for Public Land, an organisation focused on creating parks and preserving land, which is serving as project manager.